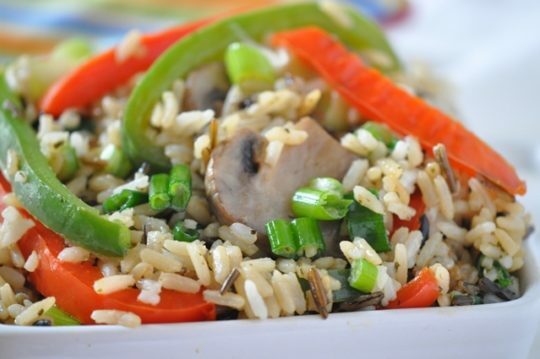 Out of oven space, you’ll love this jazzed up rice recipe with earthy wild rice, mushrooms and colorful antioxidant packed peppers. This recipe is from trim&TERRIFIC Eating Well to Fight Arthritis. Cook wild rice according to package directions; set aside. In large nonstick skillet, heat oil and sauté red and green peppers, and mushrooms until tender, 5 - 7 minutes. Stir in cooked wild rice, white rice, and green onion. Nutritional Nugget: The carotenoid-rich bell pepper provides powerful protection helping reduce the risk for certain cancers and boosting the immune system.